Standing like a sentinel atop a weathered fence post, an Eastern Bluebird poses against a cloud-bedecked sky and surveys its domain. Notoriously shy, the bluebird seldom ventures into neighborhoods where bird feeders offer up grains and seeds. It prefers living in easy reach of open spaces and quiet groves. Dempsey Essick, a Past-President of the North Carolina Bluebird Society, has been a constant force, along with other bird fanciers, to educate the public on the plight of the challenged Eastern Bluebird. 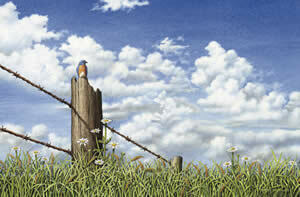 "King of the Field" faithfully depicts a typical scene of a bluebird perched on a very realistically painted barbed wire fence post with a cloud-bedecked sky in the background. The clouds in this painting represent a breakthrough for Dempsey, or, indeed, any artist working in transparent watercolors. In watercolors anything white, from clouds to snow to daisy petals, is portrayed simply by leaving the white of the paper unpainted. The problem with clouds is that they aren't flat white but billow and twist and are rounded by shadows. This presents a real problem for the painter, one that Dempsey has been working on for years. Now he has developed the technique for painting clouds realistically and never again will he have to keep his view aimed down, away from the sky. "King of the Field" was reproduced as giclee, using a new printing process which is more versatile and renders a print very close to the original painting. This painting holds special meaning to me because it allowed me the opportunity to experiment with painting clouds in watercolor. I worked long hours to develop a technique that would produce the softness of the clouds. The technique involved wetting the paper, applying the paint, and allowing the paint to run naturally. I wetted and rewetted the sky forty some times to get this effect. I wanted to give the impression in ‘King of the Field' that you are on a blanket looking up at the Eastern Bluebird in his awesome domain and I think I achieved that.